What the relationship between identity and sortal concepts is like has been a problem for a long time. Peter Geach has championed what is called a relative identity thesis according to which identity must be relative to sortal concepts such as river and cat. 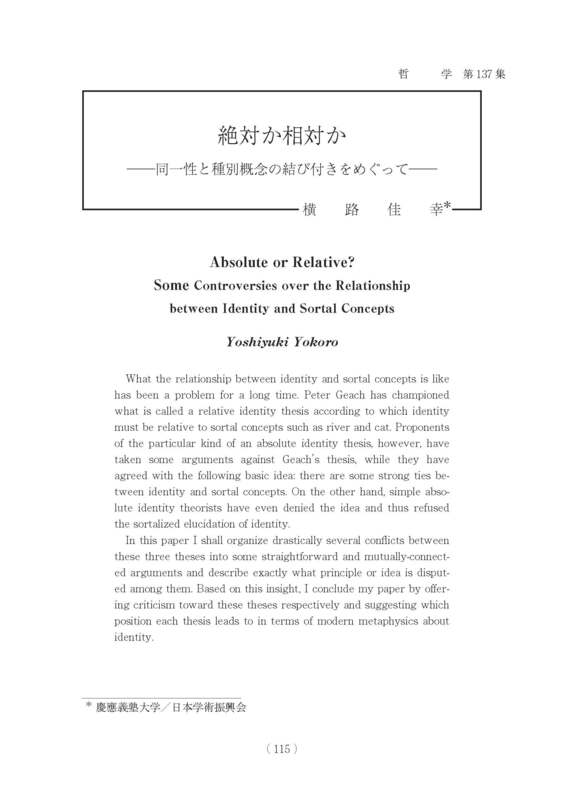 Proponents of the particular kind of an absolute identity thesis, however, have taken some arguments against Geach's thesis, while they have agreed with the following basic idea : there are some strong ties between identity and sortal concepts. On the other hand, simple absolute identity theorists have even denied the idea and thus refused the sortalized elucidation of identity. In this paper I shall organize drastically several conflicts between these three theses into some straightforward and mutually-connected arguments and describe exactly what principle or idea is disputed among them. Based on this insight, I conclude my paper by offering criticism toward these theses respectively and suggesting which position each thesis leads to in terms of modern metaphysics about identity. Feb 22, 2017 Modified; Title Kana, Title Roma-ji, Abstract. Feb 22, 2017 Modified; Title Kana, Title Roma-ji.